This article is about the Companions faction. For companions for the player, see Followers. To learn more of the Companions and their history, see the lore article. The Companions' sanctuary is the Nordic longhouse just below Dragonsreach, in the Winds District of Whiterun. This is an ancient and honored mead hall where generations of the Companions have met. According to local legend, Jorrvaskr is actually the oldest building in Whiterun. It existed alone on the mountain while the city was built up around it over the centuries. It features a main dining area, below which are the living quarters for the whelps and for the Circle and Harbinger. Outside, there is a training area, and close by is the Skyforge, where the Companions' weapons are formed. The forge itself is large, ancient, and built outside on a mountain, close to the sky. Below the Skyforge is a ceremonial area known as The Underforge, which is out of bounds except on rare occasions. 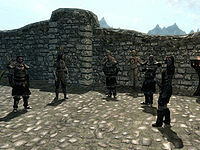 You may apply at their guild hall Jorrvaskr in Whiterun by speaking with Kodlak Whitemane. Improve the Skyforge to make Ancient Nord armor and Nord Hero weaponry. Several members become possible followers after the quest line is completed. Once the Companions quest line has been finished, you are named Harbinger. The advantages are that now you can command most of the Companions to aid you in battle, and you can now forge Ancient Nord Armor and Nord Hero weaponry at the Skyforge. The primary Companions quest line consists of six quests; multiple radiant quests must also be completed over the course of the quest line. Three achievements (50 points; 2 Bronze and 1 Silver) are unlocked by the Companions quests. Within the Companions exists The Circle, an inner sub-faction of the highest and most prominent members, all of whom are Werewolves. When the game tells you to "Talk to the Companions leaders for work", this generally means Farkas, Vilkas, Aela and Skjor. However, not all of them will necessarily have jobs for you at this time, but at least two of them will. The reward amounts for radiant Companions quests do not progress as intended. Instead of progressing evenly from 100 gold for levels 1-9 up to 300 gold for levels 40 and above, the reward given is 100 for levels 1-9, 150 for levels 10-19, then 300 for levels 20 and above. The level is also based on when the player completed the previous quest (or level one for the first quest), not the player's level when receiving the quest or its reward. The Silver Hand radiant quests are available even after annihilating the Silver Hand. This page was last modified on 15 April 2019, at 04:07.